Data analytics tools also enable energy-efficient operations, as software can forecast weather and wave conditions, helping inform the heading and operational mode with optimized fuel consumption, a crucial advantage in complying with increased environmental regulations. With the objective of capitalizing on this emerging digital opportunity, GE has developed SeaStream* Insight asset performance management solution. Working in collaboration with Maersk Drilling, GE will help deploy SeaStream Insight on one of Maersk Drilling’s rigs with an aim of increasing productivity through big data and reducing maintenance costs by up to 20 percent. This partnership is a prime example of how digital technologies are shaping the future of the offshore marine industry. 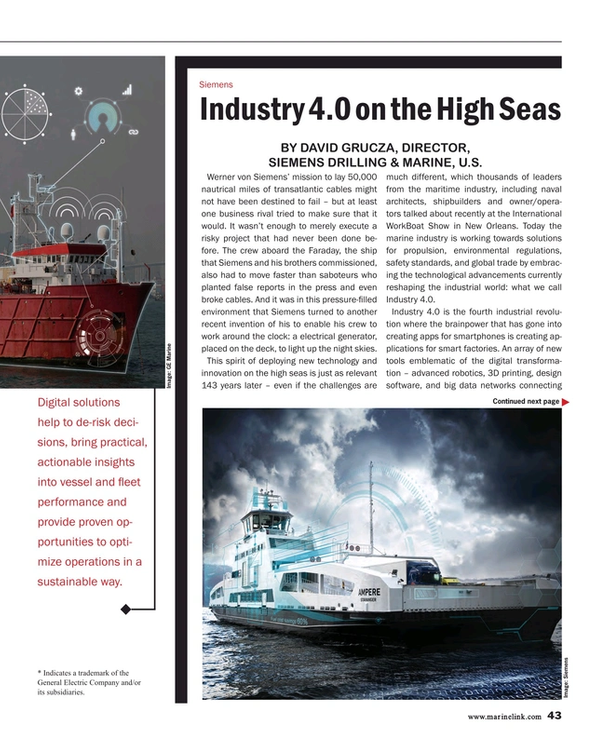 While uncertainty may be the new norm in the marine industry, through digital technologies, we can seize the opportunity to lead the transformation of the marine industry.